Students from Hadarim High School (Ha-Dream) in Hod Hasharon, Amit Yeshiva in Modiin (TRIGON) and from the American International School at Even Yehuda (Falcons) won first place at FIRST, Israel’s largest Robotics Competition which took place on April 4th at the Menora Mivtahim indoor arena. Together with Yeruham’s Yteam who received FIRST’s prestigious Chairman’s Award in recognition of their exemplary leadership in STEM, and Yafia who won the Rookie All Stars Prize, the five groups will travel to Detroit to participate in the FIRST International Robotics Competition for high school students, to take place on April 24-27. In addition, six outstanding participants received scholarships from the Technion. Destination: Deep Space was the title of this year’s competition, and the students were given a ‘one-type mission’, to build a robot that can intake and eject cargos and hatches, climb to third level platforms, construct a cascade elevator that accesses the different heights of the rocket. All this within an intense 6-week time span that included planning, design, programming and construction. Over the course of the three-day competition, tens of FIRST teams, comprised of motivated high-school students, competed at Menora’s indoor arena. The place was a hub of activity filled with an energetic and vibrant atmosphere as the teams assembled their robots and prepped them for the big competition. FIRST is a USA-based non-for-profit organization established in 1989 by inventor, entrepreneur and STEM advocate, Dean Kamen. His goal is to inspire youth and instill in them motivation and curiosity and encourage them to pursue all that FIRST stands for: Inspiration and Recognition of Science and Technology. Technion President Prof. Peretz Lavie is the Chairman of First Global. FIRST Israel was founded 15 years ago by Lieutenant General Avihu Ben Nun, former commander in chief of the Israeli Air Force. Ben Nun, who serves as the Chairman of FIRST Israel recounted how he had met with Dean Kamen back in 2005 and was presented with an opportunity to establish a FIRST branch in Israel. “After a brief discussion with my close friend Benny Kedar, we decided to take on the challenge.” Understanding the heavy load that establishing such an initiative entailed, they sought out Technion as their strategic partner. Technion President Prof. Peretz Lavie welcomed the initiative and gave the program full patronage. “Since that early time, the program has grown rapidly and today our goal is to have 20,000 students by the year 2020,” said Kedar. The FIRST project has made considerable headway in many regional councils across Israel. “It’s really very similar to a youth movement, many students are drawn to FIRST because of its exciting and innovative nature,” said HaKfar Hayarok youth representative Shira Linik. “FIRST has promoted STEM studies at our school and there are currently over 250 students who study science and technology. We have named our robotics program, The Bunker (secret hideout). It has become our second home, and we often stay there until late, getting ready for upcoming competitions, continued Shira. Prof. Emeritus Kaftory brought the FIRST project to Technion at the same time as Avihu Ben-Nun. With the help of Eyal Hershko, who was recruited for this purpose and with the generous contribution of Josh Weston, the two groups joined forces and established the organization. Points are allocated not only for technical competency but also for a range of other criteria. Social outreach is a key component and each team has a member whose responsibility is to initiate projects within the community. Ben Nun emphasized FIRST’s core attributes: the first, a five-year work plan carried out by leading experts at MIT. The second, FIRST Israel’s group of 1,500 volunteers who devote their time and efforts to this cause and third, letting the students take the lead. The mentors present the questions but the students are required to provide the answers and not vice versa. “This is how they attain the task of creating a robotic device which can carry out complex tasks within a limited six-week time span. It is an empowering and meaningful experience,” said Ben Nun. FIRST holds four annual competitions arranged according to age groups; FIRST Lego League Jr. for kindergarten until 4th grade, FIRST LEGO League, FIRST Tech Challenge, and FIRST Robotics Competition. As of 2013, the competition has officially become a Technion-named project. Over 200 municipalities from all over Israel are actively involved in FIRST’s programs which promote creativity and provide children of all ages with a set of key skills for their future careers. 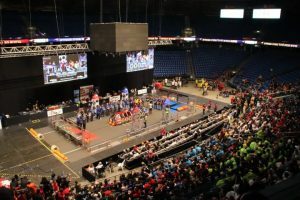 The positive impact of FIRST Robotics Competition on its participants is gratifying. Many former FIRST program graduates remain actively involved in the program and take time off from their work willingly to support, mentor and assist the students in any way they can. “We are a FIRST FAMILY,” said proud parents Dan and Tami Bilberg, who arrive every year to support their daughter in the Robotics Competition and to take an active part as mentors and judges. “We were drawn into the program without realizing that there is no exit. Once you join FIRST, you’re in for life,” said Tami.